Sweet story with a sweet, hard-working girl as the star. Journey with Ellie Maust, an Amish girl growing up in the States, as she experiences an "English" school, deals with younger siblings, blossoms into a mature young woman, changes her last name to Eash, and start to build a family of her own. Amish folk are hard workers from a young age and very God- and others-oriented. Parents wish to raise their children in the Christian way and watch out for their best interests, even if the children don't see the results till much later. Ellie is a friendly and generally obedient young girl. When she does wrong, she is corrected. As a young woman, she is responsible and independent. An Amish maid tends to be disrespectful, but she later asks for forgiveness. Prayer, the Bible, and Christian fellowship are very important to the Amish. Some things that they define as "worldly" and "sinful" (such as bright-colored clothing or electricity) may be a bit extreme, but for the most part, they wish to honor the Lord with their simple lives. A verse is quoted and bits of a couple sermons are recorded. Amish baptism combines a public confession of faith and joining the church into the same event. A gypsy woman tries to tell Ellie her fortune, but Ellie refuses. These aren't exactly "violent". A buggy takes a spill, but apart from a light bump on a head, a nosebleed, and a scratch on a horse's leg, there are no injuries. Ellie's mother falls down the stairs but to no harm. A girl falls and cuts her forehead. Two children fight over a glass of water and it shatters. A non-Amish woman grabs one of her children roughly. A non-Amish woman pulls out a cigarette. None. When Amish boys take a liking to girls, they go about it appropriately. 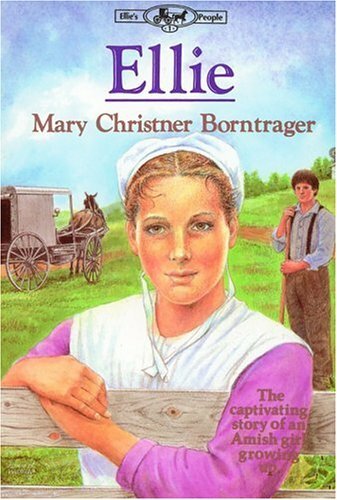 Readers get a glimpse of what Amish life looks like while following the story of a lovely girl. The morals are great and the drive to honor God is made obvious. Virtues such as hard work and obedience without argument are also emphasized.